In a superb interview with Nathan Gardels, Minister Mentor Lee surprisingly (or not surprisingly for anyone who has lived in Singapore) cited “air conditioning”, in addition to multicultural tolerance, as being critical to Singapore’s rise. He described air conditioning as “perhaps one of the signal inventions of history.” In addition to air conditioning, it is interesting to reflect on the intense focus Singapore has placed on ensuring that basics are met: public safety, cleanliness, affordable (and delicious) food, transportation, and access to at least basic housing. The parallel lesson for companies is never to lose sight of the fundamentals of operating a business: do all employees have their basic needs met? Is efficient infrastructure in place? Is your company’s website and social media presence at least respectable, if not appealing? Investing in good infrastructure is seemingly obvious, but damaging to the growth of your organization if neglected. Long before the days of Yelp, Lee Kuan Yew knew the power of a delighted customer and the corresponding effect this would have on reputation. 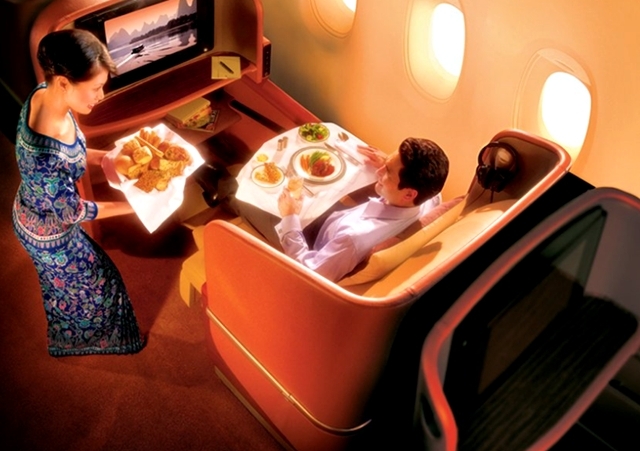 Singapore Airlines was one example of how the relentless focus on customer experience could become a powerful differentiator in an otherwise seemingly generic marketplace. I remember flying on both Singapore Airlines and Aeroflot (at the end of the Soviet Era) and literally laughing at the difference – both flew you from point A to B, but while one began each flight with hot face towels, the other welcomed you with buzzing flies to share your seat space. Customer satisfaction has a powerful network compounding effect that is all the more pronounced in the age of social media: one happy customer tells another, and with the passage of time the snowball’s momentum is startling. So ask yourself, is your company providing the equivalent of hot face towels, appetizing food and hundreds of movie channels to your customers, or are you forcing them to share their seats with unwelcome frequent fly-ers? The ability to continuously discover and share knowledge on a systematic social scale may be one of the features that distinguish human beings from animals. At the national level, two starkly contrasting recent examples speak volumes about the power of education. One is the case of Singapore, where government policy ensured its population received the highest levels of education possible, and enabled a small city-state with no natural resources to achieve one of the highest levels of GDP per person in the world. On the contrary, in Iran, there is a concerted effort by the government to ensure that entire segments of the population are deliberately blocked from access to higher education: women are banned from studying in many fields, and Baha’is (the largest religious minority) are excluded entirely from access to higher education and imprisoned for even trying to informally educate, in their own living rooms, students banned from university. Yet in its own odd way, the fact that the government of Iran goes to such lengths to take such deplorable actions is also demonstrative of the power of education, especially in todays knowledge-based, connected world. If there is such power in education at the national level, there must also be parallels for companies. One thought is to ensure that not just your staff (which is obvious), but all stakeholders: customers, partners, and investors / board members, have ways to be continuously educated about the latest advances in your industry, and what your company is learning. It’s worth thinking through how to optimize knowledge flows in the ecosystems in which your company operates. Recent trends in customer support processes are just one example: by continuously educating your customers and using new social media tools, these same empowered and knowledgeable customers can then help educate other customers, powerfully extending the reach and effectiveness of your company’s support system. As mentioned earlier, besides air conditioning, Lee Kuan Yew cited harmonious multiculturalism as Singapore’s key to success. It is the same idea as the motto of another relatively young nation that has achieved quite a lot since it’s founding on July 4, 1776: E Pluribus Unum. After race riots at the time of independence, Singapore took quite a number of practical steps to achieve this multicultural society. As an example: from the earliest age, children in schools are required to learn two languages – English as a common language for all, as well as one of three “mother tongues” of the most predominant ethnic backgrounds in Singapore. In addition, the religious and cultural holy days of all the races are treated as national public holidays. In companies too, the challenge of maintaining a common vision between different departments is ongoing and vital. Just as Singapore worked out ways to walk the path of E Pluribus Unum with practical feet, companies such as HGST and Reebok are discovering the unexpected benefits of such activities as mid-day Crossfit workouts, where barriers between departments and among executives and frontline workers are obliterated in common pools of sweat and new bonds of cross-departmental collaboration are formed. Clearly, the list of lessons we can learn from the experience of Lee Kuan Yew’s transformation of Singapore could go on for a long time. I can only hope in the short space here to share a few quick reflections that hopefully are helpful and stimulate further thought. What do you think? Have you ever lived in or visited Singapore, and if so what reflections do you have from that experience? I would like to conclude with the thought that at this crossroads of Singapore’s history, its people can take pride and consolation in the fact that while the earthly life of a great statesman has come to an end, the principles that he exemplified are timeless, and will if reflected on and applied continue to guide the Lion City as an outstanding contributor to an increasingly interconnected world civilization. 6 Hot Trends in Social Media. One is a Sociable Mongoose.